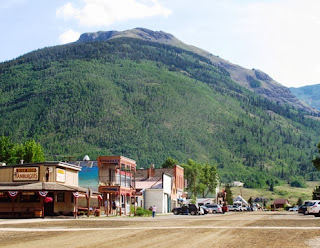 If you visit Durango,Colorado, folks will ask if you rode the train to Silverton. 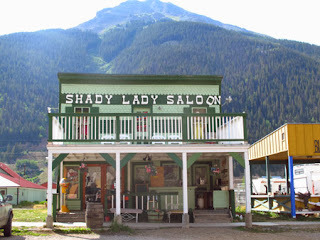 It’s such an iconic excursion that I put it on our itinerary during last summer’s trip through southwestern Colorado. But I tweaked it a bit—opting for a combination jeep and rail tour with Mild to Wild outfitters. 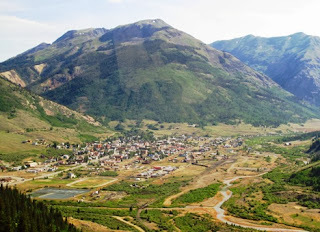 After boarding a van in Durango, we headed to Silverton, elevation 9,500 feet, 75 minutes away by automobile. On the way we rode through Animas River Valley and then over Coal Bank and Molas Passes, each just under 11,000 feet. Ponderosa pine, lodgepole pine, aspen, and small oaks dotted the countryside along with fields of blooming white, yellow, red, and purple flowers. Our guide pointed out North Twilight Peak, so named because at over 13,000 feet elevation it gets the last sunlight of each day. Homestyle cooking is a favorite at the Bent Elbow Restaurant. Settled as a mining town in 1874, Silverton has been preserved as a typical Western town. Most buildings are on the Historic Register, and the town has even inspired several movies. Contributing to its rowdy reputation was dirt-covered Blair Street, once in the shady part of town with 37 saloons, houses of ill repute, and much ruckus-raising. Now many buildings have been transformed into tourist-pleasing candy, gift, and ice cream shops. Wide, dirt roads are the norm in Silverton. Only one street is paved, Green Street, the main thoroughfare, if you can call it that. Among the buildings I scouted in a quick overview were: Avon Hotel, Silverton Hostel, Sun House (gifts), Natalia’s Restaurant (burger place), Shady Lade Saloon, and Bent Elbow Restaurant. 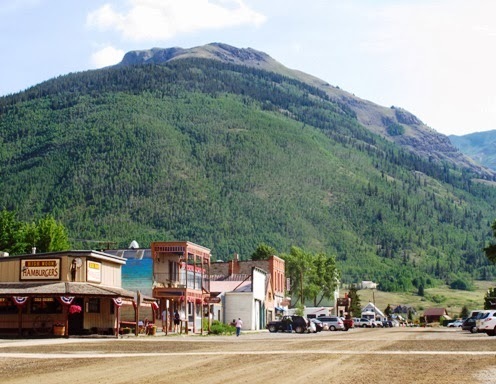 Silverton still has its original courthouse and jail and a population of about 700 people in summer; just 300 folks stick out winters here. “Everything is still tangible historically,” explained Mace, our driver on the jeep tour. “This is new history,” he added in awe. On the East Coast, where he’s from, Mace said history seems disconnected and remote rather than alive and vibrant like it is here. Many buildings are original to the town. 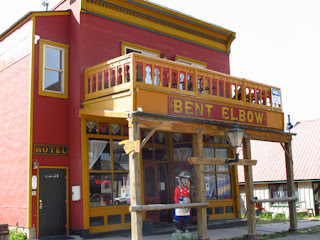 After the jeep tour, which I’ll write about in another article, we returned to Silverton and ate lunch at the Bent Elbow before boarding the narrow gauge Durango-Silverton steam train for the return journey. Tracks follow the Animas River on the way to Durango. 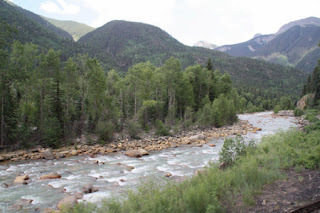 The train followed the Animas River, on our right at first, then on the left side. Every time the train passed over a bridge, crossed water (Animas River), or stopped to get more water (for steam power), the horn blew—delighting children on board. We sat in an enclosed rail car (reserved seats), but some people rode in open cars where soot can be a problem. The train burns 10 tons of coal on each round trip journey, two times as much going up as going down, and any wind can blow the residue back onto passengers’ clothing. The train rolled through scenic San Juan National Forest and passed several golf courses and a horse-riding corral. We saw Baker’s Bridge, which showed up in Butch Cassidy and the Sundance Kid. Parts of the 2013 Lone Ranger movie were also filmed on this train system. Rugged mountains provided a scenic background for the train ride. Rock walls, jagged geological formations that go straight up with irregular outcroppings, remind passengers of the mountainous surroundings. 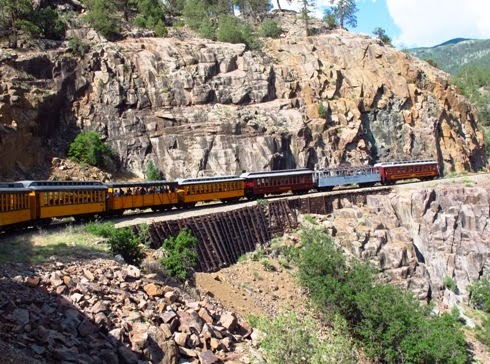 The train entered a deep canyon about one and a half hours out from Durango. About half way on the journey, the land opened up with trees and grazing areas. 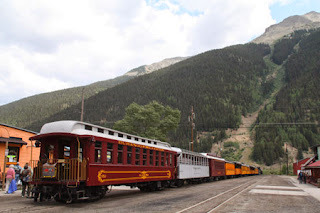 The three-hour train ride provided a relaxing way to see the beautiful Colorado landscape while absorbing some of the history for which the area is known.